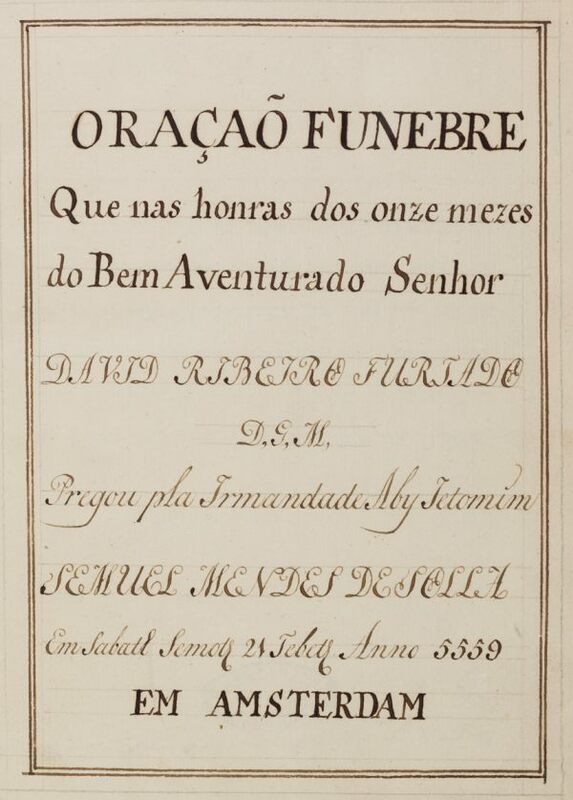 Sermon in memory of David Ribeiro Furtado delivered by Samuel Mendes de Solla. Oração Funebre / Que nas honras dos onze mezes / do Bem Aventurado Senhor / David Ribeiro Furtado / D[e] G[lorioza] M[emoria] / Pregou pla Irmandade Aby Yetomim / Semuel Mendes de Solla / Em Sabath Semoth 21 Tebeth 5559 / Em Amsterdam. Portuguese with Hebrew quotations / Paper / 23,8 x 18,6 cm. /  + 34 pp. (first l. blank) / 19-21 lines to a page / Current writing, Hebrew quotations in square writing (autograph) / Title written in several kinds of printed Italic writing / Running title on the top of each page.